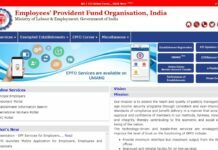 The Employee Provident Fund (EPF) is administered by Employee Provident Fund Organization (EFPO). It helps employees save a small part of their remuneration every month and hence, build a saving which is exempted from tax and withdrawable for use mainlyafter retirement. The employees may choose to withdraw the money in their EPF account to satisfy various financial requirements. The amount is very helpful at the time any major events like weddings, medical conditions, home renovations, etc. in the lives of the employees. In order to obtain the maximum benefits efficiently, the employees must be aware of the working of EPF and the withdrawal process. After death benefits – The employee can nominate anyone for his/her Employee Provident Fund account. This is a basic feature of EPF and ensures that the nominee gets full benefits of the EPF in case of death of the employee. EPF includes life insurance – Many people are not aware that EPF covers a small life insurance which is beneficial for the employee. The provident fund can be withdrawn with or without the intervention of the employer. The prerequisite is to fill up various forms for the completion of the process. To submit the withdrawal-claim through the employer, the employees first need to fill up the Form 19, Form 10C and Form 15G. Once the forms are filled up, the signature of an authorized signatory and the stamp of the company is required at the bottom of each page of the forms. The details should be filled up accurately and should match with the details present with the employer. Along with the form, the employee must submit his/her PAN card copy, cancelled cheque (with a copy of bank statement/passbook first page if employee’s name is not printed on the cancelled cheque), member UAN number is extremely important since PF form would not be accepted by PF department. These documents and forms are to be submitted to the employer, he/she will submit these to the registered PF office. Once the formalities are then completed. The Universal Account Number(UAN)forms are meant to be filled when the employee wants to withdraw funds without the intervention of the employer. If the employee wishes to withdraw the funds without the intervention of the employer, he/she must fill in and submit Form 11. This process is only applicable for those who have been contributing since January 2016. Apart from Form 11, the employee should attach a copy of the cancelled cheque of the relevant bank account (it must surely be stamped and signed by the bank manager), Form 19 (UAN),Form 10C (UAN), Form 15G.The employee must have his/her UAN number, with the account activated. The UAN database should have the employee’s bank account number, PAN card and Aadhar number. All the personal details available at UAN portal must be correct. All of these KYC documents should be approved by the employer digitally. Next articleWhat are the eligibility criteria for getting an education loan?